I think it is a good idea, that the users make their ideas official – this can both inspire the users to come up with more ideas and the creators if they need to get ideas for the development of this editor. Where you can compose, the rhythms in a similar matrix depend on the length of the bars that you want to compose it. 2. 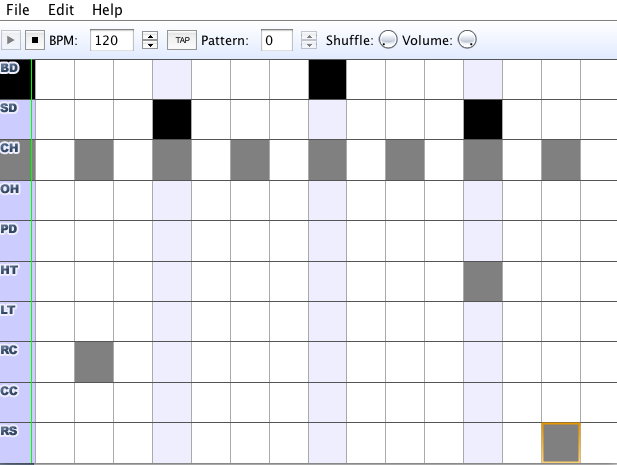 Patterns – I like to see a patterns feature where you can both record patterns in step or live recording like a sequencer. 3. Setup – I like to see a graphic feature, where you can combine your rhythms and patterns. 4. Config – I like to see a feature, where you choose the midi channel for your different programs, so you can take advantage of the unit’s multitimbral, example if you control your unit from a daw or an external sequencer. 1. All sections of the editor are titled except the "env" section. Consider adding this title for consistency. Hopefully it doesn't mess up spacing too badly. 2. Consider making 125% or 150% window size available for the VST version of the editor. Fixed is fine if manual-resizing is not supported. 3. Consider adding numbering to the oscillators and filters. The Ion has numbers "1, 2, 3" for oscillators and "1, 2" for filters. These numbers could be dark gray and a larger font. The numbers should precede each section. Yes, the number is mentioned in the osc# level dial, but this is obscure and non-intuitive, especially when Alesis made the numbering go from bottom-up. Look at the Ion's face to confirm. NOTE: The Waldorf Q, excellent in design, also has this preceding numbering system, though more logical top-to-bottom. 4. In the Envelope section, consider enlarging, bolding, or darkening the font (like the numbers mentioned above) for pitch mod, filter, and amp. The ion only has one set of knobs which are switched through each "type," so calling them out with titles is helpful. 5. Consider making a new skin which is a cross between New Age and Classic. The lighter sections of New Age is nice and easier on the eyes, but the green "LCD screens" of Classic are pretty sweet and gives more character. Other than that, the editor is solid and the best one out there! 1. After a patch is requested, and the sysex tools: Save (Selected Program) is used, have the file name autopopulate with the patch name. There is no official info/doc from Alesis that help us to find out the format of the pattern, setup, rhythm and config section (these features wont be implemented without alesis help). It is the same for sysex format of the program and other MIDI messages which we decoded all by reverse engineering. Regarding that the Ion and Micron have several hidden MIDI related and system bugs this process was so time consuming at the time of R&D an coding. we considered the other mentioned features in future development. Thanks for your feedback and suggestions.